The BBC will soon visit Swansea University to demonstrate a range of its cutting-edge virtual reality projects in a new temporary installation. Swansea University students will be able to get hand on with the acclaimed VR films that take them to the International Space Station into a magical fairy-tale forest and into a perfect replica of Albert Square’s Queen Vic pub. 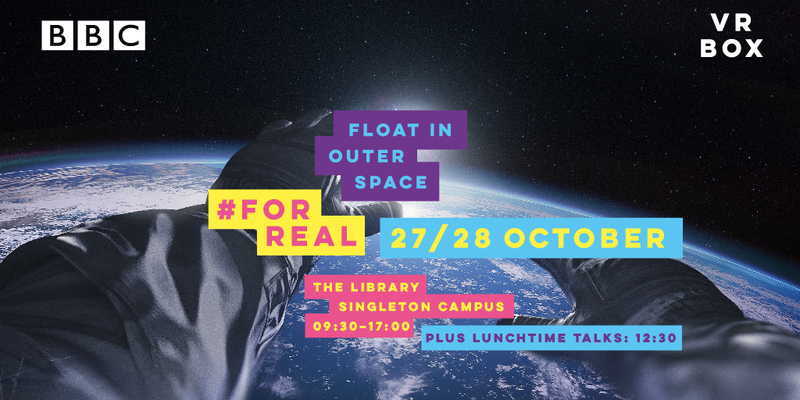 On Friday 27th and Saturday 28th October, the BBC’s world –famous Research and Development department will set up a temporary booth in the University Library at SingletonCampus, showing three of the BBC’s most exciting VR experiences. Throughout the day, students can come and try out the VR films on the HTC Vive and the Google Daydream, as well as finding out more about the amazing work BBC R&D is working on right now. Inspired by NASA and ESA’s training programmes and the experiences of real astronauts, Home - a VR Spacewalk will transport students up to the International Space Station, where they’ll be called upon to make an emergency repair out in space, 250 miles above the Earth’s surface. Home has scooped plenty of awards including a Cannes Lion, the Grand Prix Jury Award at Future of Storytelling, a ‘Best Interactive VR Experience’ award at Byron Bay International Film Festival and many more. 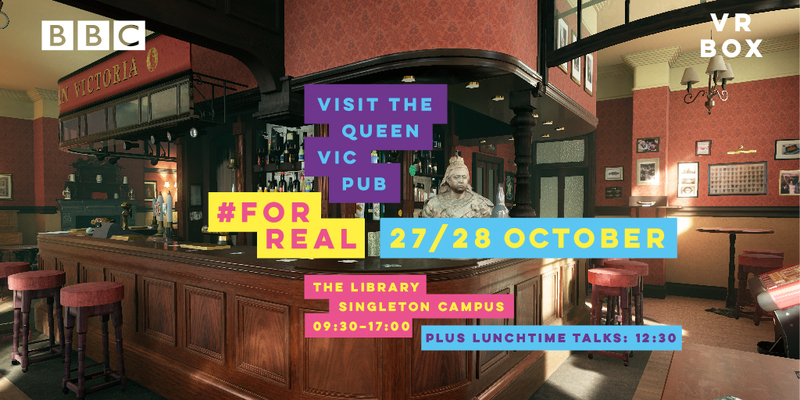 Students can play darts, pull a pint and tinkle on the Queen Vic’s very own piano in the BBC R&D first ever creation of a virtual reality TV set. It’s entirely exclusive to students as they will be the first of the public to try the Queen Vic VR. Students can immerse themselves in this beautiful VR experience, set in the fairy-tale wonderland that is Turning Forest. Equipped with award-winning state-of-the-art binaural audio, Turning Forest gives a hint of the BBC’s vision for new listening experiences in headphones and virtual reality. Forming part of the BBC’s For Real campaign, the installations will demonstrate the BBC’s most innovative and engaging world for the exciting emerging virtual reality technology field. As well as the VR films, students will also be able to try a range of 360 video experiments from the BBC on Google Cardboard headsets. 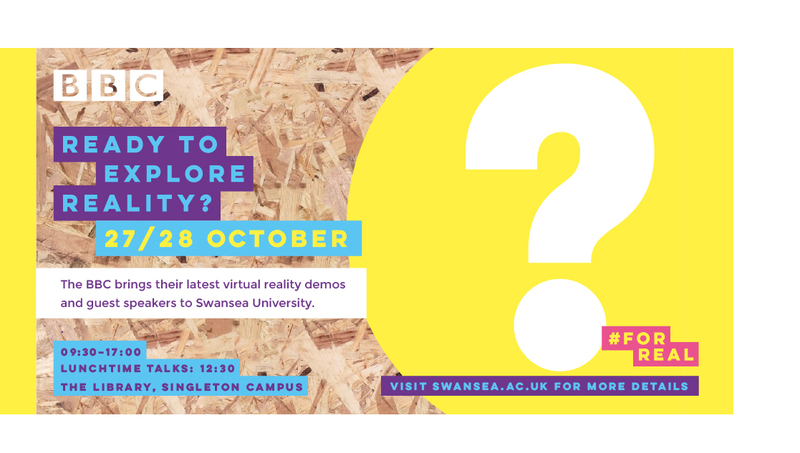 Swansea University students will also be able to drop by the booth at specific times to hear from BBC guest speakers talking about their career paths and their expert fields including 3D sound design and digital development. Students will be able to hear snippets of an episode of Doctor Who from the most recent series in binaural audio, a technology that transforms any pair of headphones into a personal surround sound system. Catherine’s specialism is sound design for radio drama, binaural and 3D sound for 360 video and VR. Catherine created the sound design and binaural mix for Ring, a horror radio drama for Radio 4. Following the success of that, Catherine has set up the first operational 3D sound studio in the BBC using their tools. Catherine will discuss the work she and her colleagues at BBC Wales have done in binaural audio and how they deliver a surround sound mix to a regular pair of headphones. She’ll also discuss how this was applied to an episode of Doctor Who in the most recent series. Ian works in the digital development team at BBC Three and has a background in scriptwriting, animation, digital production, social media and journalism. Ian will discuss his latest project Step Inside My Head, a series of shorts for BBC Three that feature people with mental health issues creating virtual reality artworks to help people understand just what’s going on in their heads, for real. Ian will also discuss how he and his team created a unique mixed reality filming technique to capture the process. The CHERISH Digital Economy Research Centre funded by EPSRC has co-ordinated the visit.